Our satellite controlled refrigerated fleet has been on the move in the whole Europe for many years, where it has been providing transport services to known producers and entrepreneurs. 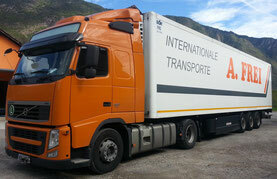 A. Frei Logistics company takes care of distribution of cooled and frozen products in the whole Europe. Technologically newest semitrailers with cooling shields controlling constant temperature during the shipment as well as trained personnel are necessary for the shipment of delicate goods. All the products are shipped observing hygiene and health regulations.